As hinted by the title, this part of photosynthesis requires light. 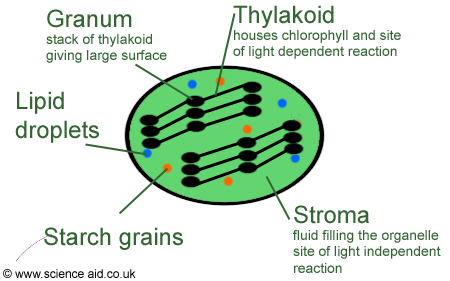 When light hits the thylakoid membranes, chlorophyll pigment becomes excited by the energy and two electrons are emitted. These pass through an electron transfer chain to produce ATP in a process known as photophosphorylation [fo-to-fos-fo-riy-lay-shun]. 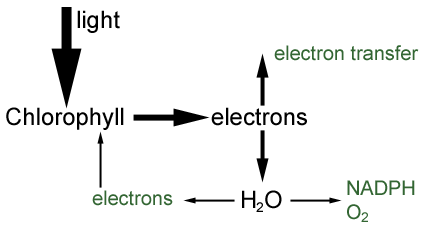 These high energy electrons are also used to split water molecules (photolysis) producing more electrons, hydrogen ions (or protons) and oxygen. This is where the oxygen plants produce comes from. Electrons are picked up by NADP to make NADPH (or reduced NADP), and these, along with some ATP that has been produced by photophoshorylation proceed to be used in the next reaction. 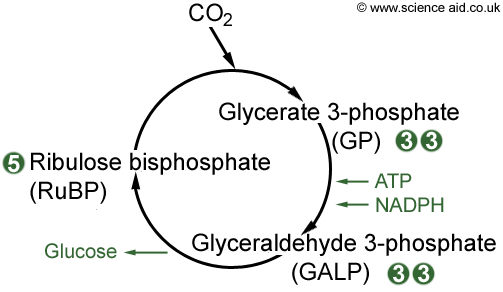 The light independent reaction takes place in the stroma of the chloroplast, involving its very own cycle of reactions called the Calvin Cycle which is outlined below. Carbon dioxide enters the cycle and reacts with ribulose bisphosphate (RuBP) to make a 6 carbon compound, which is so unstable it immeadiately breaks down to two molecules of glycerate 3-phosphate (GP).